Bronze Award: NATJA Travel Media Competition! PASADENA, CA– The North American Travel Journalists Association (NATJA) recently announced that I won Bronze place in the 2013 Annual NATJA Awards Competition in the Personality Profiles category! (My submission, Becoming Mahout, was originally published in Perceptive Travel, and came out of my experience working with mahouts at the Maetaeng Elephant Conservation Center in Thailand last year). This awards competition, now in its 22nd year, honors the best in photography and promotion that cover all aspects of the travel industry worldwide. NATJA Awards recognize excellence in travel writing, photojournalism, social media, multimedia platforms, advertising, marketing and public relations for the travel and tourism industry. This year, NATJA received 600 submissions from all over the world. NATJA is the second largest travel media association in North America. 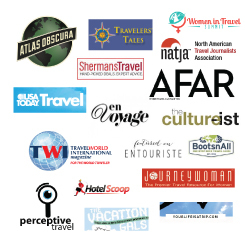 Members include travel media professionals, convention and visitors bureaus, social media, hotels and attractions, and other travel marketing agencies. Members are provided with professional development workshops, peer-to-peer evaluation, web tools and networking opportunities. NATJA also publishes TravelWorld International Magazine. Since I was working primarily with beach shots and outdoor scenes, I focused on brightness and contrast this week. I’ve been seeing a lot of nature photography utilizing the, well, what’s the technical word here…washed-out? look, as in here, from one of my favorite photography travel blogs: http://www.entouriste.com/french-riviera-road-trip/ In the spirit of bright days and calm colors, then, I played around with the brightness and contrast levels in Lightroom–and that’s it. As I get ready to pack up for my destination wedding in lovely San Diego this weekend, enjoy the pictures and wish me luck! What do you think of the light, by the way? This week, I decided to try my best at improving my night photography. But why pictures of Singapore? Well, having arrived at 9 p.m. with less than 24 hours to explore the city, I didn’t really have time to do anything other than wander around the streets at night. We flew Singapore Airlines (which, yes, was every bit luxurious as I’d heard), though I know Emirates does have daily flights to Singapore City as well. My two traveling companions, Bill and Josephine, were amazing–though they were both visibly exhausted, having traipsed around the perimeter of Malaysia for nine days, they let me, the young person, sweep them out of the hotel, find a local hakka stall to get some late-night Indian food, drag them through the nightlife at Clarke Quay and Boat Quay, take a journey on the immaculate subway, stroll along the breezy riverfront, ride the elevator up to the very top of the very swanky and wonderfully infamous Marina Bay Sands Hotel, watch me have a cocktail while they both sipped on lemonade, and join me on the long taxi ride back to our hotel. And, though I know they were up to the challenge partially because they had both taken me under their wing during the trip and wanted me to have company on my evening sojourn in a totally foreign city, I think they, too, had a pretty good time partying in Singapore City. As you’ll see in a minute, there’s no doubt I did! So this week, I got to work with editing my night shots from our whirlwind city tour. Luckily, some of the places we went had some excellent ambient light and some beautiful backdrops. My cityscape scenes, however, leave little to be desired, as I didn’t bring a tripod and my best efforts at standing still weren’t exactly stellar. But, I’m here to show you the process, so let’s revel in the good, the bad, and the ugly, shall we? #2: Taking a walk down Clarke Quay to find a yummy hakka stall for dinner. Didn’t do much with this image, as I wasn’t exactly sure what needed editing…. #3: Singaporean mee-gorung! Mmmm….. – The spicy red noodles are a little blurry, but I like the emphasis on the sunny side up egg and the Coke Zero. #4: Night street shot in Clarke Quay – I played with the noise levels a little bit to try and lighten up the photo, but it got too grainy, so I left it as-is. #5: Fanciest shopping mall there is: Marina Bay Sands. I didn’t edit this image at all, as I was surprised how perfectly clear the letters were! #7: Opera House along the Singapore River – Any idea how I get the green light to be, well, less green? #10: Impossibly hard shot to get atop the Marina Bay Sands Hotel….but at least you get the idea of how awesome the view was! #11: Macro attempt – see this delicious list of cocktails? At the bartender’s recommendation, I had the Tony Stark’s Pepper…and it was the best 20 Singaporean dollars I’d ever spent. #12: Marina Bay Sands rooftop bar – the uplighting on these umbrellas was unbelievable! I didn’t edit this at all. #14: And now, bedtime! – This pic was pretty easy to take, as I simply adjusted the white balance on my camera to account for the lamp light. No editing needed!